LeMMA is a simple GUI “front-end” written in Python for MMA (Musical MIDI Accompaniment – also written in Python). 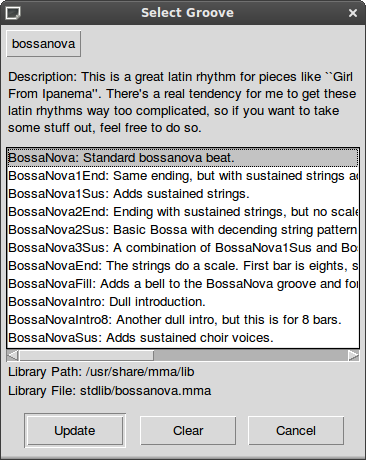 I wrote it so that I can easily churn out chord progressions. 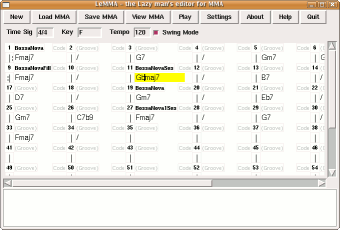 Just enter the chords, select the grooves and press “Play”. Should work for both Linux and Windows. 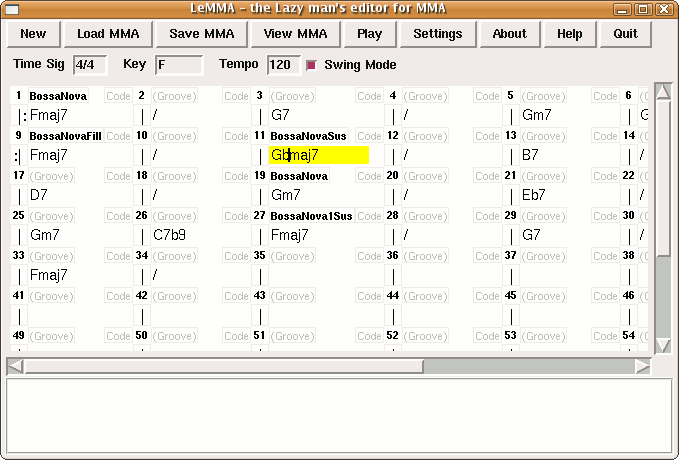 Please note that LeMMA is NOT really an editor for MMA files. 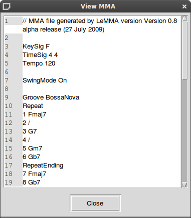 It can generate simple MMA files and read them back, but it cannot read just any MMA file, in particular those that came with the MMA package. 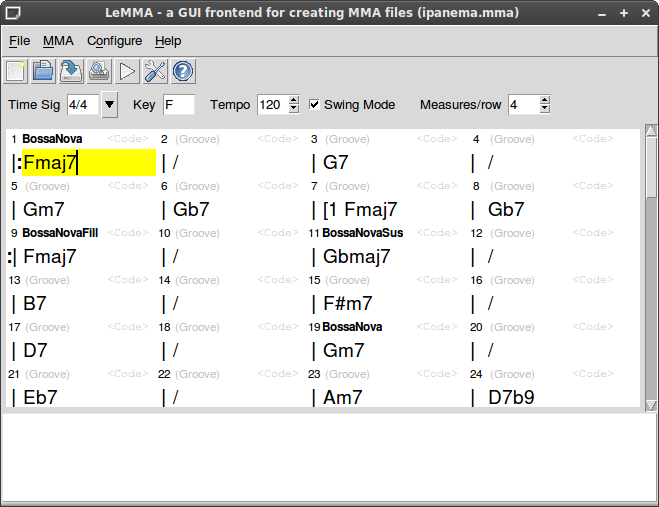 A full-fledged GUI editor may or may not be possible, but that is not what I set out to do with LeMMA. Ok, now that I’ve set your expectations, go ahead and make some music! LeMMA is now GPL software! Go to the project site. 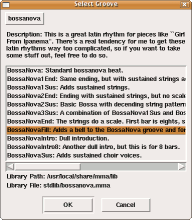 For Windows users, I recommend using it with Van Basco’s midi player instead of the Windows Media Player, because it doesn’t lock the midi file (with Windows Media player you’ll have to shut it down every time) and also because it can easily route the midi output elsewhere. I used to also route it through Midi Yoke to VSTHost, which I loaded with SynthFont’s VSTi plug-in and a bit of reverb for something a bit nicer than what my crappy laptop soundcard can deliver. 22 Aug 10 – Version 0.9 alpha. 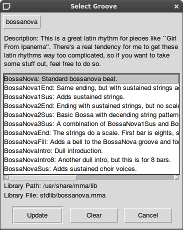 Transpose chords function. Support for PyGame midi engine. Restore python 2.4 compatibility. 27 Jul 09 – Version 0.8 alpha. GUI refresh and usability improvements. New config file format. 26 Mar 09 – Version 0.7.1. Added install script for Linux, supports saving of settings in ~/.lemma. Fixed bug in settings save location. 1 Mar 09 – Version 0.7. Many bugfixes and error handling codes, especially for Windows users. 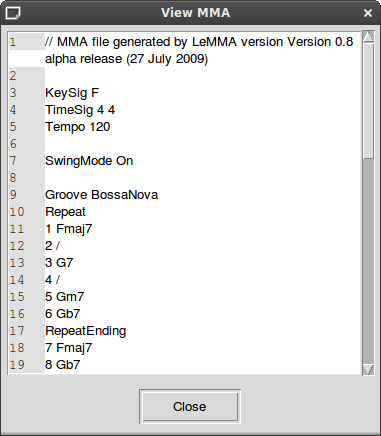 9 Feb 08 – Version 0.6 Alpha. Interface revamp, new features and various bugfixes. Since the changes are many, I’m releasing it as alpha for now. Please read the changelog that comes with the package. 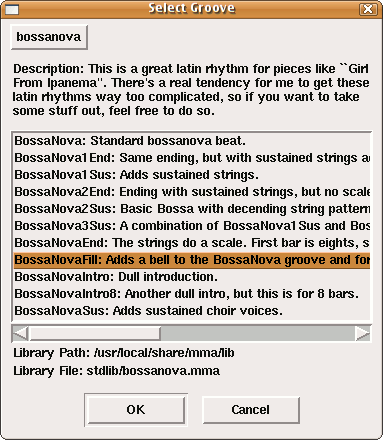 10 Jun 07 – Updated grooves library to MMA release 1.2. You can also simply click the “Refresh grooves” button in the Settings dialog.